One word describes the atmosphere at Get Up Stand Up office on Friday. Relief. 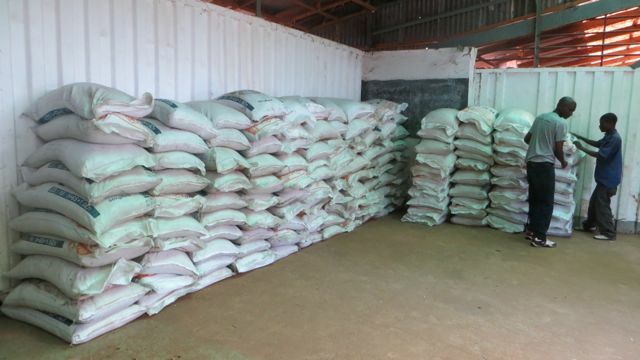 The much-awaited 600 bags of two different types of fertilizers arrived on Thursday evening and were offloaded on Friday, 25 October morning. 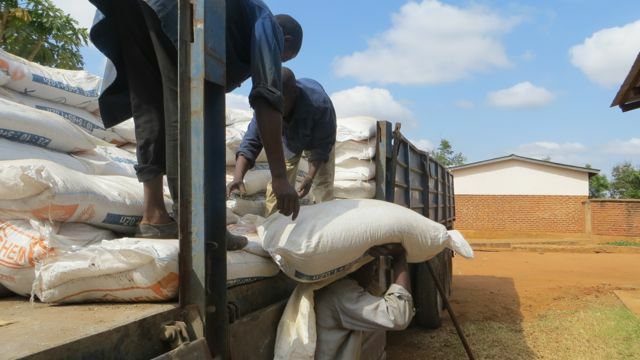 Henry Goster, the Get Up Stand Up Project Coordinator says he is relieved that the fertilizers have arrived just when the rains have just started in some parts of Balaka. “What remains now is for us to organize a meeting where we tell farmers when they start to get the fertilizers and seeds on credit and how they are going to pay back the loan,” says Goster. Goster also disclosed that the project will reward the farmers group that repaid its loan in time. About 250 farmers will benefit from the project this year alone. Get Up Stand Up is a micro credit project that helps farmers to access seeds and fertilizers on credit. Get Up Stand Project is under Andiamo Youth Cooperative Trust and is funded by the “Associazione notarile di solidarietà di Bergamo”. This entry was posted in News from Malawi, Social Development and tagged Andiamo Youth Cooperatuve Trust, Get Up Stand Up. Bookmark the permalink.